In 1994, amendments to the U.S. Marine Mammal Protection Act allowed American sport-hunters to import trophies of polar bears they had killed in Canada. 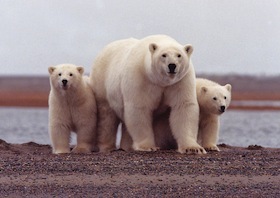 More than 900 import permits were issued between 1997 and 2008, when the designation of the polar bear as "threatened" under the U.S. Endangered Species Act ended the program. This map shows who applied for import permits and where their trophies came from. It is based on information publicly available in the U.S. Federal Register. Polars bears in the Southern Beaufort Sea, 2006. Source: USFWS. Click a marker (circle) to show application details. Click an applicant name to search official Federal Register for matching records. Click a population outline to highlight, hide, or show all markers for that population.